Guilty is a searing personal record of spiritual and communal crisis, wherein the death of god announces the beginning of friendship. It takes the form of a diary, recording the earliest days of World War Two and the Nazi occupation of France, but this is no ordinary day book: it records the author's journey through a war-torn world without transcendence. Bataille's spiritual journey is also an intellectual one, a trip with Hegel, Kierkegaard, Blake, Baudelaire, and Nietzsche as his companions. And it is a school of the flesh wherein eroticism and mysticism are fused in a passionate search for pure immanence. Georges Bataille said of his work: "I teach the art of turning horror into delight." 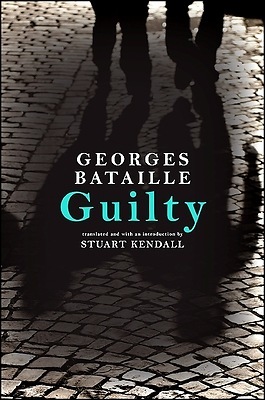 This new translation of Guilty is the first to include the full text from Bataille's Oeuvres Completes. The text includes Bataille's notes and drafts, which permit the reader to trace the development of the book from diary to draft to published text, as well as annotations of Bataille's source materials. An extensive and incisive introductory essay by Stuart Kendall situates the work historically, biographically, and philosophically. Guilty is Bataille's most demanding, intricate, and multi-layered work, but it is also his most personal and moving one.